THESE CASE SELL FOR $17,500.00 NEW!! Exterior Body: front of unit is provided with curved glass of 0.25" (0.64 cm) overall thickness tempered glass panes. Each side of glass is trimmed with black aluminum extrusion formed to match the curvature of the glass front. Base of cabinet is 18-gauge stainless steel over 14-gauge galvanized steel bottom structure. Exterior top of display case is constructed of 18-gauge stainless steel. Exterior sides are finished with stainless steel. Unit is completely insulated with 1.50" (3.8 cm) polyurethane insulation. Adjustable feet allow for leveling. Exterior Body: Front of unit is provided with curved thermopane glass of 1.00" (2.54 cm) overall thickness with (2) tempered glass panes (outer pane) 0.25" (0.64 cm), (inner pane) 0.18 (0.48 cm). Each side of glass is trimmed with black polyethylene extrusion formed to match the curvature of the glass front. Base of cabinet is 18-gauge stainless steel over 14-gauge galvanized steel bottom structure. Exterior top of display case is constructed of 18-gauge stainless steel. Exterior sides are finished with stainless steel. Unit is completely insulated with 1.50" (3.8 cm) polyurethane insulation. Adjustable feet allow for leveling. At Capital Equipment Sales we have over 15 years experience in selecting quality preowned restaurant and bar equipment. 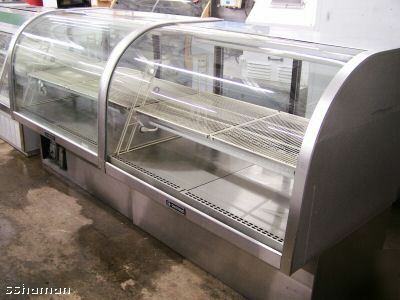 We only resell late model, and select pieces of restaurant equipment. We do our very best to test our equipment to make sure it is functioning properly but be aware everything is sold as-is with no warranty. If we don't have what you are looking for please call we may have it in our warehouse. Call us anytime with any questions.